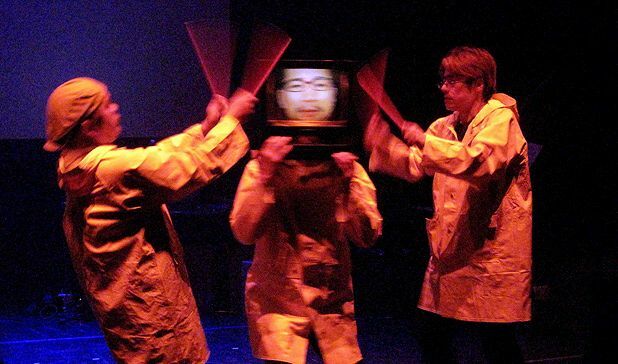 Taking the amusing, confusing chaos that fills such Japanese cultural signifiers as Katamari Damacy and any weird animé trip, and turning it into a live stage show of technological and imaginative brilliance, Shut Up, Play! is unlike anything else you're likely to find. From ingenious shadow play performances to ecstatic sound adventures, and taking in crisps, dripping water and repeatedly beating a head stuck inside a television, everything screams of a curious joy, and of finding the art in the most simple of things. It's all done with extraordinary precision though, and tech savvy brains that will make wonder at just what exactly a Mac can't do. It's the human drum machine that impresses most though, all covered in various electronic sensors, and able to keep a beat whilst taking a few bruises. The audience participation manages to be both the most polite and most insane seen at the Fringe yet, all eager smiles and applause, but all the time looms the danger of a soaking. There's a great humour with it all though, and this is a wonderful piece of performance art, theatre, music and whatever else the brain can think of.